Claim: African health officials confirmed that a factory worker suffering from Ebola bled into a batch of chocolate, potentially infecting millions of pieces. 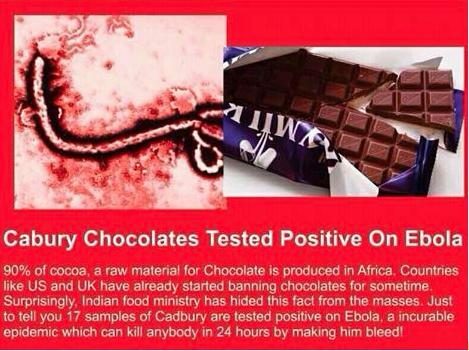 Did an unknown ebola victim actually contaminate chocolate with the disease & ship/distribute the chocolate to the U.S.? I saw this on Twitter. chocolate factory worker infected with Ebola had “bled” into a batch of chocolate. For reasons unclear in the tweet, the Ebola-infected chocolate was then packaged and sent abroad just in time for Halloween trick-or-treating activities. In less than a day, the tweet was shared thousands of times. Annual concerns about the safety of Halloween candy coupled with then-current Ebola fears ensured the rumor of Ebola-infected chocolate would spread and stick. Suffice it to say no such warnings about Ebola and chocolate have been shared by public health officials in Africa or elsewhere. Even if the increasingly unlikely scenario posed in the tweet involving a late-stage Ebola patient were to occur, chocolate is not a medium for the transmission of Ebola. Ebola is not spread through the air, or by water, or (in general) by food. However, in Africa Ebola may be spread as a result of handling bushmeat (wild animals hunted for food) and contact with infected bats. There is no evidence that mosquitoes or other insects can transmit Ebola virus. Only a few species of mammals (for example, humans, bats, monkeys, and apes) have shown the ability to become infected with and spread Ebola virus. While there is some concern a worsening Ebola crisis could affect global chocolate prices, Ebola-infected chocolate is not a credible public health risk.